I blame Ellie for this. I saw a picture of sweet tea on her blog and oh my heavens… I don’t usually make sweet tea in the winter, so that picture was a clear sign to me that summer is here, and with it my favorite drink! I’m the only sweet tea drinker in the house, so I make it in smaller portions. In a quart size Mason jar I put 1/2 cup sugar and one pitcher size tea bag, and fill it with cold water. Then the magic: set it in the sunshine! I let it sit out there all day till the sugar is dissolved and the tea is nice and dark. I like it strong! Once the sun is down and it’s done, put it in the fridge to chill. If you’re in more of a hurry, just add boiling water to the mix and let the tea steep for 15 minutes. For something a little different steep with a tea bag and a cinnamon stick. Serve over lots of ice and add a slice of lemon if you like. Or lime! Or orange (great tip, Jerri — I forgot that one!). Nothing beats this on a hot summer day! Haha, I take full responsibility/blame for this one. And can I tell you how much I LOVE that you put it in a mason jar??? i love sweet tea. and i like orange slices in mine. Ellie, I couldn’t decide if it should be “blame” or “thank.” Ha! And of COURSE a Mason jar! Jerri I can’t believe I forgot that! Added it in. Thanks! Now this is a tea that I can enjoy in the summer months – thank you for sharing! This takes me right back to summer when I was a kid. My mom used to make her tea in a big glass pitcher left on the patio next to the pool all afternoon. YUM! I loved your tastspotting.com blurb, “More refreshing than the sprinkler.” I love that! It’s true! 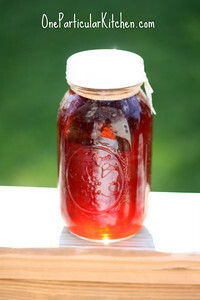 Sweet Sun Tea is a favorite of mine, and howcome tea always tastes better coming from a mason jar? I love sun tea. I think I will make a pitcher first thing….tomorrow. Yours looks so refreshing. This post reminded me how much I love sun tea! I’ve been making it every day for a week now. I’m sending a CARE package to a sweet Southern boy stationed in Afghanistan and he LOVES his sweet tea. I wanted a cute way to send it to him, and this is perfect. Thanks for posting! !